WHAT ARE THE 20 BEST CULINARY SCHOOLS FOR 2016? Robuchon potatoes are cooked in lightly salted water with skins on and then drained. the potatoes are then peeled and passed through a food mill .. dried out over a low flame and then emulsified with butter and milk. And, then to achieve that velvety texture, the potatoes are passed several times through a fine drum sieve. The classic Robuchon mashed potatoes, as is served at the L'Atelier de Joël Robuchon uses a ratio of potatoes:butter = 2:1. However in Robuchon's book written by Patricia Wells which was targeted for American audiences, the ratio is given as 4:1. 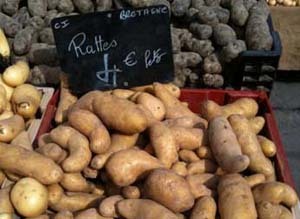 The Ratte is a small potato with a unique nutty flavor and smooth, buttery texture. 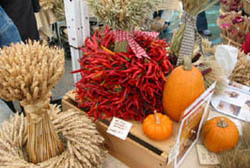 The variety originated in France or Denmark in the late 19th century. It is the potato preferred by Chef Joël Robuchon for making his mashed potatoes. The potatoes are now also grown in the US. 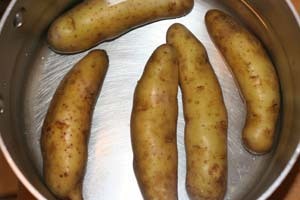 Scrub the potatoes (shown to left are Ratte's from Union Square Market) Do not peel the potatoes. Cook them in their skins covered by at least 1 inch of water. For each liter of water add 10 grams of salt. Simmer uncovered over moderate heat for 20-30 minutes or until a knife can easily be inserted and removed. As soon as the potatoes are done remove and drain. Do not allow them to sit in the water. Meanwhile, bring the milk just to a boil in a medium sized saucepan and set aside. 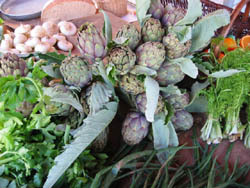 Discard the skin after it has been peeled away. Place the pan over low heat and using a wooden spatula stir the potatoes to dry them out (approximately 4-5 minutes). 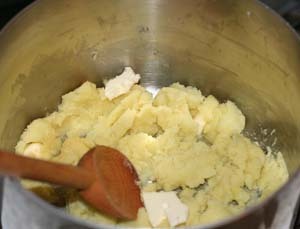 Begin adding 3/4 of the butter, little by little vigorously stirring until the butter is incorporated. 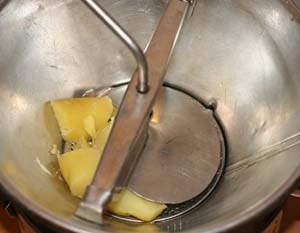 This should be done in a similar manner as one prepares any butter emulsion (starting off with a very small amount of butter to start the emulsion). .Slowly add the milk in a thin stream (a little at a time) till the desired consistency is reached. You may only need a very small amount of the milk, depending on the potatoes used, amount of butter used, and personal taste. Stir vigorously till all the milk is incorporated. 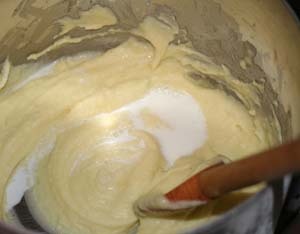 Then stir the puree with a whisk to incorporate air and make the puree fluffy. Pass the puree through a fine drum sieve to further lighten and smooth the dish. 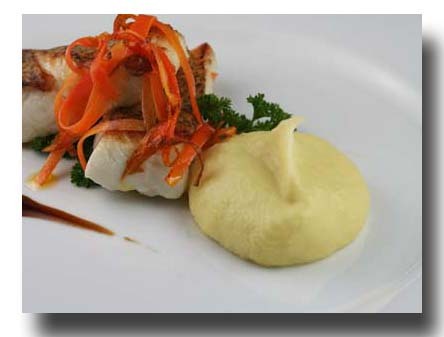 This can be repeated 2 or 3 times for to make the puree silky smooth. Taste for seasoning. 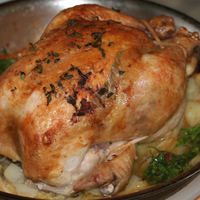 If not using immediately, place in the top of a double boiler over simmering water. Whisk occasionally to keep smooth. 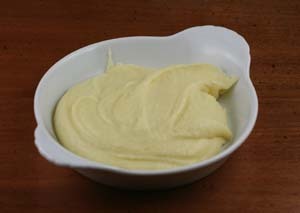 The puree can be further adjusted with hot milk or butter before serving. If you don't serve the potatoes immediately you can keep them warm for an hour using a double boiler. Remember because they are so rich you only need a small amount per person. 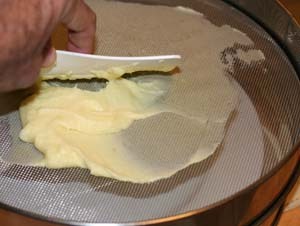 Note: Robuchon will sometimes use olive oil or goose fat for some of the butter, and nutmeg or saffron as seasonings.